> Issue 44 of Soccer History Magazine is now available to buy, either as a download or in print version. The contents include the following articles: The culture of the Kop and the origins of modern singing; The early years of Aston Villa; The story of Stoke’s Sentinel Cup; Portsmouth Ladies FC in WW1; Blackburn Olympic; Heading for trouble; Scottish Juvenile FA internationals; Researching the history of reserve and junior teams; plus more articles, reviews and obituaries. 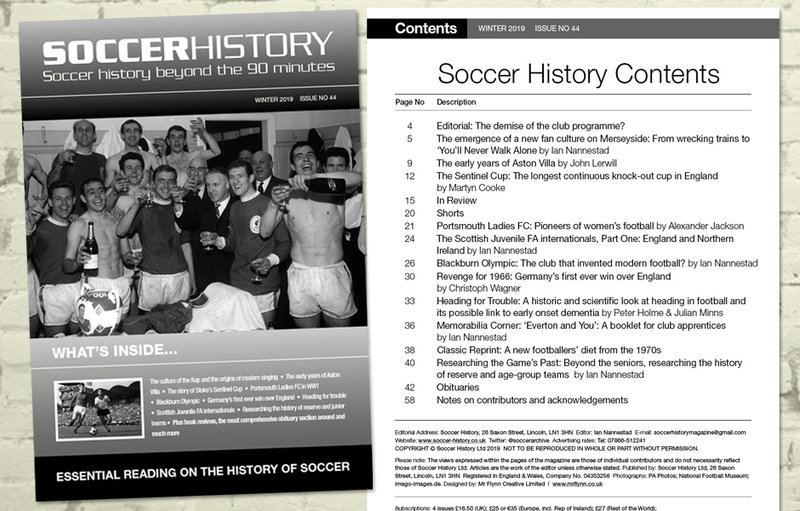 Soccer History Magazine is a journal devoted to the history of the world’s greatest game. A typical issue has 56 pages, containing 6 articles, plus book listings and reviews and obituaries. The magazine is available by subscription by post for printed issues throughout the World, you can also download digital PDF versions, order back issues using the subscription form and view an example articles PDF for free. We seek to promote research into all areas of the history of the game. We are just as interested in the story of important matches and individuals as in the social, cultural and economic aspects of soccer. The content focuses on the professional game in England, Ireland, Scotland and Wales, although we also feature articles on amateur football and on the history of the game in other countries. The articles are mostly based on new and original research, and cover a full chronological range from the 1860s, when soccer was first codified, through to the 1980s. 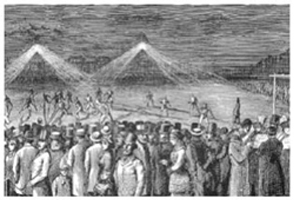 Soccer History first appeared in 2002 and since then it has earned a reputation for quality writing and ground-breaking research. Read your favourite soccer magazine on your phone, tablet, and desktop. Subscription Rates - Print Issues. > Would you like to contribute an article for the magazine? > Do you have an obituary you would like to submit to us? > Do you have any names to add to our list of Internationals and Football League and Southern League players who were killed during World War One? > If you are the publisher or the author of a book about soccer history please let us know the details. Issue 44 of Soccer History Magazine is now available to buy, either as a download or in print version. The contents include the following articles: The culture of the Kop and the origins of modern singing; The early years of Aston Villa; The story of Stoke’s Sentinel Cup; Portsmouth Ladies FC in WW1; Blackburn Olympic; Heading for trouble; Scottish Juvenile FA internationals; Researching the history of reserve and junior teams; plus more articles, reviews and obituaries. As a taster we offer some sample articles from past issues of Soccer History Magazine. These cover a range of the sort of articles you might find in a typical issue of the magazine, ranging from social and cultural history (community singing, World Cup Willie and the evolution of the mascot) through to major events such as the opening of the original Wembley Stadium in 1923 and the migration of British players to France in the 1930s. Soccer History was first produced in 2002. All previous issues of the magazine are available either as downloads or in print form. To see what’s inside each issue go to ‘Download Issues’ and scroll down to find the Contents Page for each issue. Many footballers, professional and amateur, internationals and parks players, made the ultimate sacrifice during World War One. At least three players – Donald Bell, Bernard Vann and Willie Angus – won the Victoria Cross. Here we present a roll of honour of well known footballers, past and present, who died on military service during the Great War. Sign up to our FREE monthly newsletter! We aim to be in touch at least once a month with the latest Soccer History updates, delivered straight to your email address.